This evening I gave all of the plants some foliar 2-15-4 that also has magnesium and sulfur in it along with 2 tablespoons of seaweed. I haven't measure any of the pumpkins for a while now. They all seem to be growing. The following is a list of the GPC official weigh-offs in Colorado. This is where you will see the biggest pumpkins in Colorado being weighed. Bring a pumpkin or bring your family. Most of the weigh-offs have a carnival like atmosphere and is fun for kids of all ages. Come say hi to me if you stop by. Gave the plants some more foliar this evening. Also been dealing with that rodant issue still (little bugger). This morning I pollinated a female on the main vine of the 1421 plant with pollen from the 2009 clone. I'm really hoping this one takes. It is about as good a cross as I can think of. As long as there isn't a freak early cross there should be just enough days to have viable seeds from that pumpkin. This morning I noticed a couple of bite marks on the face of Stanley. I got some bleach solution and when I was checking around I found a hole dug underneath the pumpkin. I've filled the hole and put some additional moth balls around the pumpkin. I'm hoping the little bugger hasn't gnawed a hole into the pumpkin. I also found some surface splits around the stem of the pumpkin on Elbert. They are minor and I've bleached them but they will have to be watched. This evening I gave both plants some compost tea with about 2 tablespoons of fish & seaweed in the compost tea that I gave to the 1421 plant. If you would like to grow giant pumpkins next year here are the three things you should do in the next two months. First come to one of the RMGVG giant pumpkin weighs in Colorado. You can find dates and times on www.coloradopumpkins.com. Next join the RMGVG. Not only well you get a packet of giant pumpkin seeds with the best genetics in the west but you will also get the club newsletters with tips and advice on how to grow. Lastly, in early fall start prepping your planting area for next year. 80% of what grows a giant pumpkin in the summer happens in the fall and early spring when you are prepping your soil. Read what I did last fall and based on your own soil reports get advice from local growers on how to properly build your soil for next year. It can be a great family activity or lot of fun for someone who just wants the biggest jack-o-latern on the street next fall. This evening I sprayed the pumpkin plants with Actinovate to help slow down powdery mildew which is starting to show up. At this point of the season I'm not overly worried about it, but I don't want to let it get out of control. The 335 plant has shown the worst early signs of it but it is okay. In the last few days I've seen it show up on the 1421 plants older leaves that are shaded. Strangely the 1775 plant has shown none. What is strange about that is that with the leaf burn this plant has sustained you would think it would be more suspectible but I haven't seen any spots on it so far. Since the 1421 has got a hole in it I'm going to use this time to do some experimenting on it. I want to keep the pumpkin solid but I also want to see how big I can get this thing. Over the next 5 weeks I'm going to play around with the amount of water and fertilizer I'm going to give the plant. In the past September weight gains haven't been great. I'm going to see if giving the plants a touch more fertilizer can help with the gains. Note that I say a touch. I know that if you give a plant too much fertilizer, too fast you can actually slow the growth of the pumpkin down. If you give the plant too much fertilizer too fast you can also split the pumpkin open. The later I don't have to worry about so I'm going to some experiments to see if I can find a sweet spot for future years. The morning I gave the plants a foliar multimineral. This evening I gave the 1421 three ounces of Fish & Seaweed with an added tablespoon of seaweed. The 1775 I gave three ounces of 0-1-1. I've got some females that should be opening up in the next 2-5 days on the 1421 that I will try to pollinate with the 2009 clone and/or the Ford plant. Those would be some excellent crosses. My son's 335 plant has a very nice pumpkin on it. I can tell he is really proud of it. We are going to try to pollinate a female on it again with either the 2009 clone or my 1421. That would be an excellent cross as well. These will just be seed pumpkins. You have to appreciate the growers from the RMGVG. A lot of nice notes today that are greatly appreciated. Also got some nice notes from some heavy hitter friends and world record holders. Pumpkin growers are the best. I can't feel too bad about this year. Met many of my goals. Got over 1000 pounds, grew a nice orange pumpkin and learned a lot this year. As Ron Wallace said Colorado is going to see a 1500 pounder soon. Dag Nabit: Lost Stanley Today! Lost the big 1421 pumpkin this morning to a blossom end split. Estimates 1,107 this morning and was putting on 15-18 pounds a day. I'm guessing it would have ended up at about 1,420 pounds if it hadn't had split based on its current growth rate. That would have broke the Colorado state record. This pumpkin seems like it would have gone heavy as well. I've decided to try to limp it along and get it to the weigh-off so I can get an official weight. I've sprayed the hole with bleach, put sulfur powder in it and then caulked the hole. I also have covered the pumpkin to keep it dry. Usually pumpkin growth slows down a lot once air gets in the cavity so we will never know what it could have been. This morning I sprayed 3 1/2 ounces of liquid fish and seaweed on the ground under the 1421 leaf canopy. That plant has been sucking up a lot of nutrients all summer long and I've put little to nothing on the ground over the last month. The rhizosphere around the plant root hairs can only pull nutrients from so far so I figured it was time to give the ground a little boost. This evening I'll do some foliar multimineral with Lithovit in it on the 1421 plant and give the same plus 0-1-1 to the 1775 plant. It has been record temperatures the last two days in Denver with maybe another record today so I've been giving the plants extra misting and a little extra water on the ground. When carefully stepping into the plant to spray I checked the stump and took off any of the new growth around the stump so it could get sun on it. This time of year you'll get a lot of new leaves and vines popping up and I believe it is best just to get rid of those. This evening I gave the 1421 plant a quick brew of compost tea with some molasses, earthworm castings, 1 tablespoon of liquid seaweed, 1/2 cup of alfalfa and about a 1/2 cup of Big Bloom in it. In the foreground is Elbert and in the background is Stanley. 42 more days and I hope to post some more pumpkin pictures. I'm hoping that both of these pumpkins hold together until then. I gave both plants some foliar magnesium sulfate with a touch of mulitmineral this evening. The sunset was very nice tonight. It was good to finally have a warm day for the pumpkins. This week is the first time in about two months that I've given either of the pumpkin plants any substantial amounts of fertilizer. I've talked about foliar applications of a lot of different stuff but most of that had very little to no NPK in it because either the quantity was so small or it was mostly just minerals. This evening I hit the 1421 plant with about 3 ounces of foliar 2-3-3 liquid fish & seaweed (every dog and cat in the neighborhood will be at the pumpkin patch) and the 1775 plant with about 3 ounces of 0-1-1 with one tablespoon of liquid seaweed added. I was told by John Tabernera back in late June that in mid-August I would need to hit that plant with phosphorous because of the high nitrogen on that side of the patch. Once I week I'll do that. The growth on the 1421 has naturally slowed due to age so tonight's fertilizer will give it a bit of bump hopefully. Depending on how the pumpkin reacts over the next three days I'll probably give the plant 3-4 ounces of fish & seaweed twice a week for the next 4 weeks. I've been watching the 335 Scherber that was crossed with the 2009 clone and there has been no growth for a week. The pumpkin is very small but still shiny. The other pumpkin on the plant seems to be sucking everything out of that plant so I'm not sure that pumpkin is going to make it. Kind of sad because that pumpkin is really cranking for its size and growing conditions and the cross with the 2009 is perfect. For the last three years I've been spraying Acinovate on my pumpkin plants with some pretty good success. I haven't had bad powdery mildew at all. Just the regular spots that show up in September. Spraying in the first part of August is important in order to keep the powdery mildew at bay before it becomes visable. Once it starts showing up there isn't much you can do about it. This year I expect the powdery mildew to be a challenge. Particularly cool days in the last week have brought up signs of powdery mildew on susceptible weeds. The older leaves on my son's plant have spots and I've removed those to help keep it from spreading. Fortunately neither of my plants have much of any signs so far. It surprises me that the 1775 plant hasn't shown more because many of its leaves are pretty beaten up from leaf burn. I put some Actinovate in the compost tea I brewed earlier in the week but most of that was put on the ground. This evening I sprayed a healthy dose on everything, including the weeds around the plants to help keep it in check. Warm days ahead are going to make the powdery mildew blossom. Two years ago I had a very nice pumpkin going on a 1,204 Scherber. It was on track to grow between 1,050 and 1,100 pounds. That year my pumpkin was on the patch tour. The pumpkin looked pristine that day. Three days later the pumpkin split, on day 50 where a dill ring intersected a deep rib in the pumpkin. A dill ring is an internal crack in the pumpkin. It runs perpendicular to the ribs in the pumpkin and it is a silent killer. Slowly the crack goes deeper into the meat towards the surface of the pumpkin and sometimes it reaches the surface of the pumpkin and then your season is done. Two years ago I was able to limp that pumpkin along and get it to the scale. However two days after the split the growth went from 20lbs per day down to 9 so it never got to its full potential. Sometime after about 45 days dill rings and blossom end splits tend to show up. I believe both have genetic pieces but I think mostly they happen due to issues with how nutrients get to and move through the pumpkin. Too much water or too little water and boom. You've got a problem. Even watering and a proper fertilizer program can help prevent that but there is only so much you can do. Even with the cool weather Stanley has continued to grow relatively well all considering. Elbert is oranging up and maybe has a chance at a Howard Dill award. It is a very uniform and nice looking pumpkin. Unfortunately it didn't get the grow gene from its mom. This evening I sprayed a tablespoon of multimineral and a 1 1/2 tablespoons of 0-0-1 liquid seaweed per pumpkin plant. More cool and rainy weather today. The weekend is looking to finally heat up however. This evening I gave both plants some compost tea with Photsynthesis Plus, Big Bloom, Actinovate, molasses and Azos in it. This was sprayed on the ground. I then gave the 1421 plant about 1 1/2 ounces of fish & seaweed. I would have given it more but there is potential for big rain in the next 24 hours and I don't want a sudden spurt in growth. Just as the good doctor predicted, slowed growth on the pumpkin has shown a bit up extra growth on the side vines after the pumpkin. I gave them an extra spray of fish & seaweed to encourage the growth. Strange weather these days in Colorado. Cooler and cloudier than any August I can remember in recent history. Pumpkin growth has been slower because of it. Most days have been in the high 70s and low 80s with low 50s at night. This evening I gave the pumpkin some CalCarb with some insectocide. It was great to see everyone on the pumpkin patch tour today. We sure have a great bunch of growers and Wiz always puts on a nice event. This year growers came to my patch, Scherber's and then the Wiz & Biz patch. 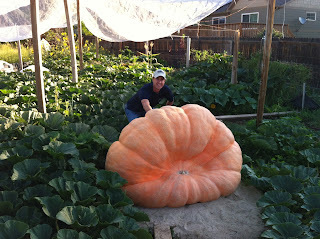 Joe has a very nice 1623 pumpkin growing. I told Joe this 2 weeks ago and I still think its true. Joe's pumpkin is a few days behind mine in growth but it has so much growth after the fruit that I think come September he will catch me. However I wouldn't have thought that my pumpkin would be at 900 pounds at this point of the season based on the current plant growth so maybe I'll be wrong. This evening I gave the 1421 some foliar multimineral and seaweed. I also gave the vines after the plant some 0-1-1. The 1775 I gave the same with some additional 0-1-1 added. As promised, the following is a video of my pumpkin patch as shot earlier in the week. Very pleased with where things are at right now. Stanley continues to grow very well. Warning: this video and its narrator may cause drowsiness. Do not drive or operate heavy machinery while watching this video. This evening I sprayed the vines on the 1421 plant after the pumpkin with some NurtiCal to try go get a little better vine growth after the pumpkin. The big rains never happened today at all. Cool temps today however in Colorado. Today I spent some time hacking out some unwanted growth around the stump of the pumpkin plant as well as pulling weeds. About once a week you should check the stump to make sure there isn't any rot. You can lose the stump quickly if it starts to rot out but with some bleach and sulfur powder you can stop a problem before it gets going if you catch it early. I cover my stumps with a clear plastic hydroponic growing lid that I've cut one end off of. A few years ago when I was having problems with a stump I put that over it to keep it dry and the rot cleared right up and didn't come back. I've used that same lid every year since without problems. Today when checking my 1421 pumpkin I found a small dent in the pumpkin where it looked like the pumpkin had been lightly hit. Maybe an inch long and about a quarter inch tall that spot was oozing some. After conferring with the good doctor (Scherber) I lightly scraped out the area (it was just skin deep), wiped a 50% solution of bleach on it and then put sulfur powder on the spot and made sure it would stay dry. I expect it to scar up but I'll check it daily until it does. There have been very small ooze spots in different locations across the skin of the pumpkin. I wiped those down as well. They are normal when the pumpkin is growing and happen as pressure inside the pumpkin squeeze out the juice. They aren't normally a problem but those spots should be watched. Rain this evening with more rain in the forecast for tomorrow so I just gave the plants some compost tea with Big Bloom in it. This evening, after burying some vines, I sprayed both plants with some foliar multimineral and liquid seaweed. Once Stanley's growth has slowed down some I'm going to give it some larger doses of Fish & Seaweed (about 4-6 ounces). I might also give the vines after the fruit some NutriCal. Still deciding on that one however. The vines are still very slow growing after the pumpkin (which is typical) but they seem to be getting well rooted now (the leaves are getting bigger) which means they should start to back feed the pumpkin and start vining more. No pictures of the pumpkin this week. The RMGVG patch tour is a week from today so come on by and you can see my pumpkins for yourself. For those of you who can't make the patch tour I'll try to shoot a video of the pumpkin patch and post it next Saturday. Growth on Stanley has been up and down and back up again. I think it is either bad measurements (this pumpkin isn't easy to measure) or weather. I talked with Pete and he saw the same thing as me the last four days. Up and then down for two days and then back up again. Growth on the good days has been very good. Growth on Elbert has been consistent but not very fast. I'm hoping it will be a long grower because I'm not seeing big daily gains. I gave both plants some compost tea with Actinovate in it this evening. The Actinovate was added in the last 5 minutes of a 24 hour brew. If you don't have any go out and buy Actinovate now and apply it on your plants around August 15th. Among other things, Actinovate is good for preventing powdery mildew and in Denver the powdery mildew always seems to appear around the last week of August. By applying Acinovate around the 15th I've found it makes a big difference in keeping the powdery mildew away. And having healthy leaves in September can make all of the difference.